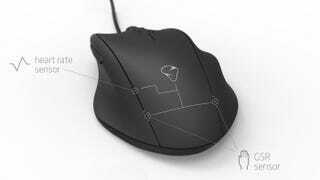 Mionix, makes of fine PC gaming mice, are working on something new. And it falls somewhere between a gaming mouse and...Nintendo's Vitality Sensor. It's called the NAOS QG, and is intended to be the first entry in a line of peripherals known as "Quantified Gaming". The idea being that by embedding sensors in the surface of the mouse, it will be able to track your heart rate, galvanic skin response and APM (actions per minute). This kind of thing might not be for everyone, but for pro gamers, it sounds like a pretty cool idea, as it would allow them to track their "performance" and stats (and share them) like an athlete would on the track or field. Mionix is running a Kickstarter to get the NAOS QG off the ground. Which sounds a little weird seeing as they're a proper company, but a company rep told me that because they "are still are more or less a start-up", Mionix didn't have the capital to pay for the new tooling and manufacturing costs needed for the product.